GARDAÍ GOT much more than they expected when they recovered goods stolen in a burglary in Strokestown, Co Roscommon. Nestling in the haul –�sc�red during a Garda search at a property in Dublin – w�a�ld�nula and two gold sun discs. 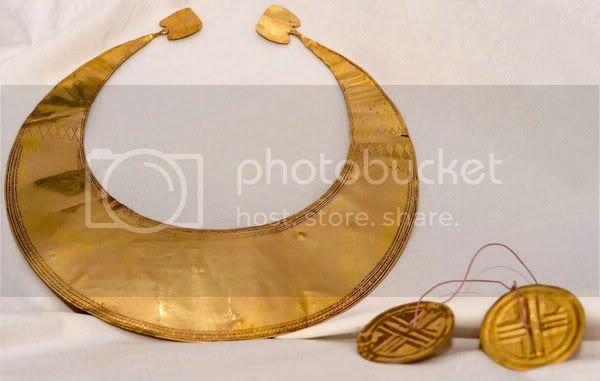 The discovery of the previously unrecorded gold artefacts was described as “high�imp�ant”� th�ation�Museum� Ireland. The lunula is a crescent-shaped ornament worn around the neck or chest area on ceremonial occasions. The museum believes less than 200 such lunulae are known to have been made by a small number of master craftsmen. The two gold discs are similar in size to a small saucer. Museum director Dr Patrick Wallace said the items would have been in use on ceremonial occasions in about 2000-1900 BC. “I would �sider t� to be a�ry important discovery,” he said. �rdaí from�e Lo�fordR�omm� division sa�the discovery followed an extensive investigation into the break-in at a pharmacy in Strokestown in the early hours of March 27th. It is understood that the objects were contained in a safe containing drugs, cosmetics and antique jewellery. Gardaí contacted th�National Muse� of Ireland w� they saw the three artefacts. Two archaeologists from the museum have been working with gardaí in Roscommon � recent days in�n attempt to p�the items in context.Gardaí said it was st�l unclear as to h� the items turn�up in the safe before the theft. Under the National Monuments Act, any artefacts discovered should be surrendered to the State through the National Museum of Ireland. Garda sources indicated that there was not expected to be any prosecution under the Act. The items are to be brought to the National Museum of Ireland. Two men were arrested on April 1st in connection with the burglary. They were charged and are due to appear before Strokestown District Court on April 22nd. what can ya say really, other than "wow...."
I often wondered in recent times just how many invaluable objects from our past have been uncovered by people who keep them for themselves. Then there are those who destroy or rebury them to prevent a disruption of building work (and I do believe this happens!). The understanding such finds, especially unique ones or ones where only a very few examples have been found to date, can give us about our past is invaluable. The thought of it all makes me ill.